Looking for a way to get your little one excited about brushing? 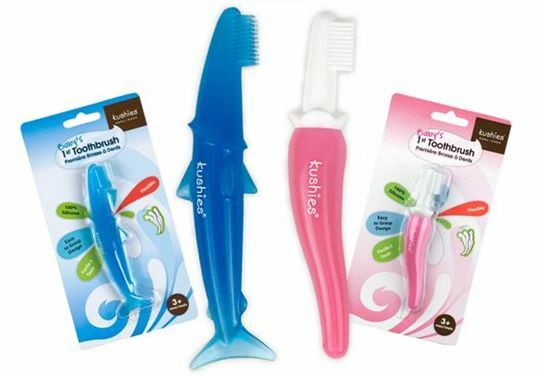 Kushies Baby’s First Toothbrush with its fun long fish / chili pepper shape can help. This first toothbrush, available in pink or blue, doubles up as a toothbrush for new teeth and a soothing teether for sore gums. Made with 100% silicone, this safe toothbrush is latex, lead, phthalate, PVC and BPA free. It’s even freezer safe, and best of all when it starts looking icky, you can just pop it in the dishwasher. If this first toothbrush isn’t exactly what you’re looking for, check out our list of 5 eco-friendly BPA-free toothbrushes for tots.